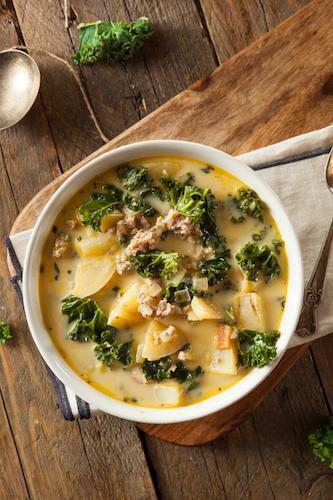 This sausage soup is a healthier version of restaurant favorites like the Olive Garden. Creamy and delicious as the weather turns colder! Heat a heavy pot to medium. When it is warm, add the sausage and cook sausage until browned. Remove meat from pot and set it aside in a bowl to be added back later. In the same pot, add a bit of avocado oil and saute onion until translucent. Add the garlic and stir it together with the onion until it is fragrant. Add the cauliflower and chicken stock and simmer for 20 minutes. Using an immersion blender, blend the ingredients in the pot until it is smooth and creamy. Add in your chopped potato and let it simmer for another 15 minutes. Then add in the chopped kale, the cooked sausage, and season with salt and pepper to taste.